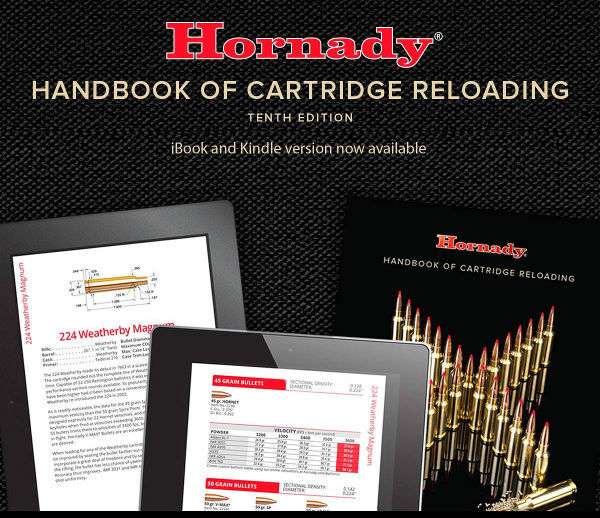 The latest 10th Edition of the Hornady Handbook of Cartridge Reloading is now available as a digital eBook. Choose from two digital formats: iBook (Apple iOS), or Kindle (Amazon). Here are the links to download the Reloading Handbook. Price is $19.99 for either choice — a 33% savings over the $30 Print Version. This 1000-page resource includes many new powder and bullet types. In fact Hornady’s testers shot over 1300 load combos to provide updated load data for this 10th Edition. If you click on the Amazon Link above and then select “Look Inside”, you can preview actual pages from the Hornady Reloading Handbook (10th Edition). You can view 101 pages. This includes the full list of cartridges, plus featured articles explaining hand-loading methods, cartridge design, ballistics and more. 1. You can take the load manual everywhere, stowed in your cell phone. 2. You can zoom the display screen to enlarge the type (good for old eyes). 3. You can easily search for cartridges, and then “drill down” by powder or bullet weight. 4. You can take screen shots and save your favorite load recipes as image files. 5. Information can be more readily updated with eBooks. The 10th Edition Hornady Handbook of Cartridge Reloading features over 1,000 pages of reloading data, techniques, and bullet information. From 17 caliber varmint cartridges to large dangerous game loads, the handbook covers over 220 different cartridge types featuring a variety of loads for the full line of Hornady® bullets. The 10th Edition also features new and expanded data. New powders include: Power Pro 2000 MR, IMR 4451 and 7977, CFE Pistol, BE-86, Reloder 23, 26, 33 and 50, Accurate LT-30 and 32, and some offerings from Shooters World. Popular established powders like Reloder 17, Superformance,® and LeverEvolution® have also been expanded to more cartridges. The latest Hornady® bullets, such as the ELD-X® and ELD® Match line, have been incorporated into the data. Plus, we’ve added more GMX®, SST® and FTX® offerings. New cartridges include the 280 Ackley Improved, 7×64 Brenneke and the 338 Federal. Well over 1,300 load combinations were shot to update and expand the reloading pages in this edition. 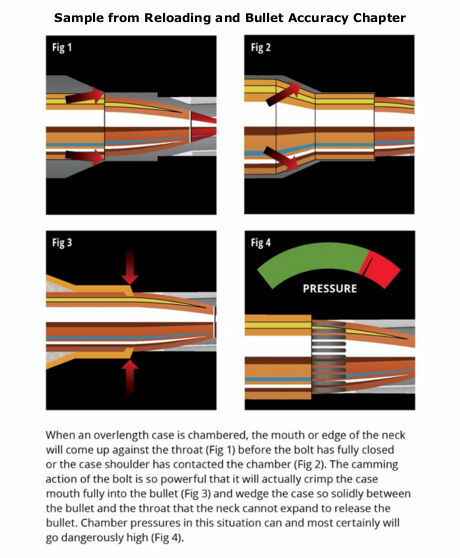 Like previous editions, the handbook offers explanations of internal, external and terminal ballistics. We have also highlighted the Hornady® Standard Ballistic Calculator (ballistic coefficient based) and the patent pending 4DOF™ Ballistic Calculator (drag coefficient based). Share the post "New Hornady Reloading Manual Offered in eBook Format"
I have the iBook version of the 9th Edition. Unless they dramatically improved navigation, and you won’t know until you buy it, I recommend staying with the print edition. While the data and info is good, moving from one cartridge to another is extremely inconvenient. The flip side is that having it on my iPad is great. Using it on a cellphone is kind of silly due to the size of the font.